When Ben Affleck gave up directing duties on the solo Batman film, it was obvious things were grim. And while the latest rumor seems to suggest they’re just getting worse, at least this time there may be a silver lining. The new rumor surfaced in Forbes. They’re reporting Matt Reeves (Cloverfield, Dawn of the Planet of the Apes) is indeed the frontrunner to take over directing duties vacated by Affleck and, if he does so, it might be with a brand new script. 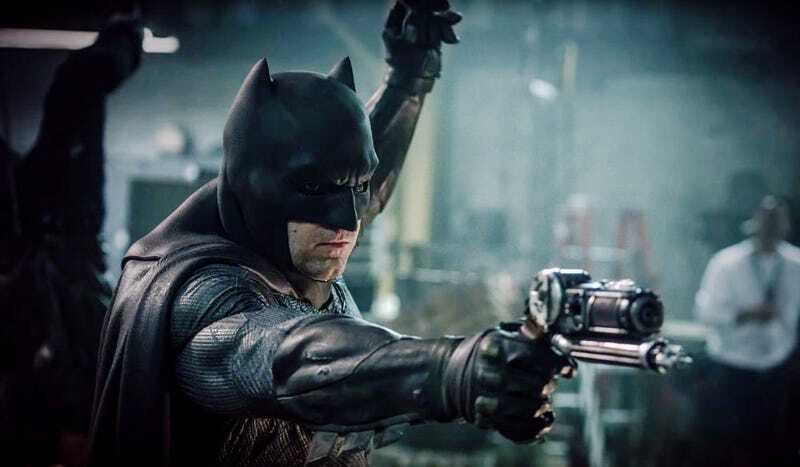 Reportedly, the current script is by Affleck and DC Films guru Geoff Johns, with a polish by Batman v Superman and Justice League writer Chris Terrio. However, that script “will undergo substantial changes and possible/probably another full rewrite” once a new director takes over, according to the report. Warner Bros. has a strict “No comment on rumors” policy so we have to take this with a grain of salt. If it’s true, though, it certainly makes a bunch of sense. Movies are their scripts. Period. If the script to The Batman was really good and everyone was confident with it, Affleck would have been shooting immediately. He certainly wouldn’t have left the project. Instead, it seems likely the possibility of a not-quite-good-enough story is the main culprit here. And since the director takes most of the blame on this (everyone blames Zack Snyder for Batman v Superman, but never credited writers Terrio or David Goyer, right?) Affleck got rid of that responsibility when he left. Should the film not connect, whoever takes over knows the blame would fall solely on their shoulders. They better be damn well confident the script works before yelling “Action.” Which only means good things for the movie. That is, unless, Warner Bros. and DC Films hire someone who just wants to make a Batman movie, script be damned. It’s certainly not a foreign concept for a movie this size. If that’s the case, a rewrite would mean nothing. But, if they hire Matt Reeves, he is not that kind of person. Again, Warner Bros. would not comment on this rumor but it does seem logical. Whenever a director is announced, there will likely be script news along with it. That could happen today or it could happen after Justice League. At this point, there is no real rush. So yeah, things are looking dark. But you remember what they say about the dark, right? It’s always darkest before dawn. Update: Several hours after this article originally posted, reliable Variety reporter Justin Kroll was asked about the veracity of these rumors on Twitter. His response? Which is basically the exact opposite of everything in the Forbes article we were sourcing. Which is why we call it a rumor. Still, even if Kroll’s sources are telling him the truth, it seems like the reality could be somewhere in the middle. Even if the studio is happy with the new script, once they hire a new director, maybe that person won’t be. That person could ask for a rewrite and then everyone would be telling the truth. However, this new piece of information certainly suggests Warner Bros. is looking to hire someone willing to make their current script, not write a new one. The plot thickens and we’ll have to wait and see.